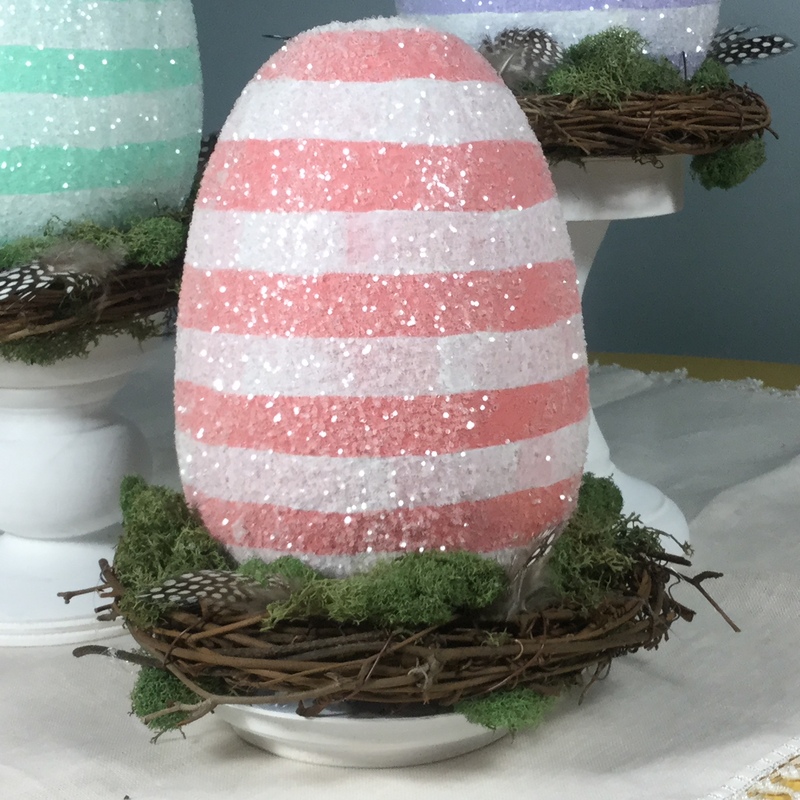 Last week I did a blog post on making glitter Easter eggs (Time to Paint Easter Eggs). I shared that I would show you another way to display them. After a little trial and error I created these stands using 2 different wooden pedestals and a round plaque from Michaels plus a few CD’s. I could picture the idea in my head right away. When I went shopping I found that these larger 6″ wreaths were too big to lay on the top of the wood stands, so I thought I could use smaller wreaths, which looked out of proportion. I thought I could open them and make them larger but they still did not look right. I then thought I could make my own wreaths using some grapevine roping…what a mess. I was then brainstorming how to make the top of the wood stands bigger and found that a CD was just the right size. Once I solved that problem everything moved along quickly. I decided to paint my wooden stands and the CD’s with a white DecoArt chalk paint called Everlasting. I sanded the bases to give them a worn look, then glued the CD to the top of each base. To assemble I randomly glued some moss to the edge of the CD, then glued the wreath to the base. Next I glued moss to the inside of the wreath and randomly on the top. To finish I slip a few feathers in the wreath. Then place your egg on end in the nest you created. (I did not glue the egg in place). Have fun with this project and I encourage you to think about other ways to create the stands. For example you could use glass candlesticks. You could also place a small tin pan or a bowl on top. A number of years ago my friend Patti gave me this little pedestal made from an old dish and a glass candle stick. This could be a fun egg holder. Your creations would look fun on your mantel or the center of your table. I am going to use mine to decorate for our family Easter party. These are wonderful Jane! SpRiNg Thyme fun! Thank you Lynn, I think we are all ready for spring weather. Very cute idea! Btw your chocolate cupcakes are to die for!!! I tried the recipe a few weeks ago. Very yummy!!! I’m going to try a raspberry cheesecake filling next time I make them. Thanks for sharing the recipe. Thank you Phyllis. So glad that you like the cupcakes, they are one of my favorites and easy to make. I have substituted peanut butter for half of the cream cheese. My family liked them. Let me know how your raspberry turn out.